The SXT5 is a modified version of the original stainless steel SXT3 and features 100% stainless steel. Reacting to new receivers on the market with thicker steel walls (such as the Toyota Tundra and Ford Duramax), TRIMAX once again proves why it is the leader in receiver locking pins. The SXT5 has an exposed pin length that is approximately 1/2" longer than the SXT3 for a total gap space of 3 1/4". 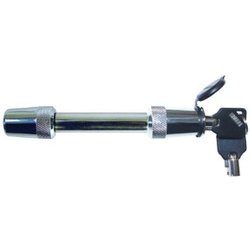 Provides instant security for your camper, boat or trailer by securing your vehicle receiver hitch. Features patented 1/4 turn technology that cannot be false locked. Width between heads (exposed pin length or gap space) is 3 1/4"